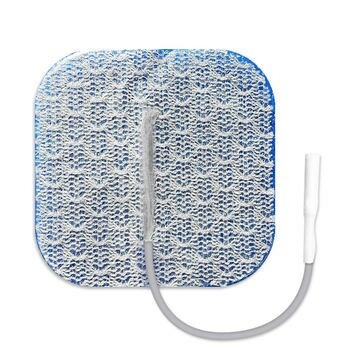 This is the best choice electrode pad for extremely sensitive skin. They are designed with a specialized gel that is thick enough to adhere through body hair yet gentle enough for use on extremely sensitive skin. They are made with MultiStick Hydrogel, a proven gel featuring uncompromising adhesion, performance and longevity. With dual layer adhesive technology, MultiStick provides optimal bonding to the electrode and to the skin. The electrode pads enhances patient comfort during stimulation by dispersing current evenly across the electrode while eliminating stinging edge biting and hot spots. Patented knitted stainless steel fabric is highly flexible allowing the maximum flexibility and conformity. Axelgaard Electrodes 5 I absolutely love this product. The ad was truthful and I'm very satisfied with these. Seems to last longer and they have more cushion than regular ones. Pros:More cushion. Thicker than normal ones. Lasts longer. Has more adhesive. Cons:When I first put it on the adhesive is alittle much, but after a few uses it works out. Super Sensitive Electrode Pads 5 The super sensitive electrode pads are excellent!. I use the tens unit to help ease my back pain. After years of wearing the pads with the regular adhesive with no problems, I finally had a reaction to the adhesive severe dermatitis on every spot that the pads touched. Need won out over reluctance to try the super sensitive electrode pads. I was delighted. I have used for approx 3 months now and no reaction. I hope this review will help others. Thank you for having the super sensitive electrode pads in your supplies. Cons:Pad gel is quite sticky and mushes out of sides when you put them on. Also sticks to clothing, however this does come off easily with your finger or rinses out with water. A small problem, but definitely worth the help from the tens unit.